There are many factors driving the increasingly prohibitive cost of rare whisky, but what exactly is inflating the price bubble – and will it ever burst? Angus MacRaild looks at the maturing secondary market, and what the future holds for those who just want to drink whisky. Out of reach: Is old and rare whisky simply becoming a plaything of the wealthy? Whisky has value. But what, and who, determines that value? At the moment, there are two debates circling this issue. One argument posits that, with retail and new releases, whisky is becoming more expensive, partly in relation to an increasingly cynical and greedy industry, and partly in response to the maturing secondary market. I feel that the reality is more complex. The majority of standard bottlings increase in price in line with inflation, or just ahead. Many independent releases are more expensive due to supply and demand – note the price of independent, single cask Laphroaigs by almost any bottler, for example. The same rule applies to older official releases. Are whisky companies more greedy? Yes and no; it is not a straightforward question. Nuance is key, as are the basic principles of capitalism. These companies exist to make money. How they do this can undoubtedly be occasionally perceived as greedy. A company such as Diageo can be slated for the pricing of its Special Releases one month, and praised for that of its Fèis Ile Lagavulin another. It’s rarely as straightforward as many proclaim. This leaves the issue of the secondary market – something which has no doubt influenced retail pricing to a degree but is still, in my view, somewhat misunderstood, with an influence extending well beyond its sibling world of retail. Whisky auctioneering began at Christie’s in Glasgow in the 1980s, before being taken up by McTear’s in the 1990s. This was whisky’s age of innocence. Look at 1990s auction catalogues today and you see they regularly list bottles such as Bowmore Largiemeanoch around the £80-120 range – a bottle which now fetches around £8,000. These were days of fledgling internet and no social media. Whisky knowledge was harder-won than it is today. A result of this was that the value of whisky on the secondary market was almost entirely anchored around the perception of liquid quality. Your knowledge and understanding of liquid informed your spending behaviour at auction directly. This created a relatively predictable, slow and plodding kind of market. A hobby market dominated by a few deep-pocketed merchants and old-school collectors. Fast forward to today: the internet and social media have led to a proliferation of knowledge and expanded awareness of, and desire for, whisky. The result is a complex, multi-tiered secondary market. On one level, it functions in a similar way to how it did 20 years ago: liquid is king. Except that this has been extrapolated into stratospheric prices by a new and extremely wealthy generation of buyers with the will to spend on these fabled bottles. This has in turn forced the old big spenders to up their game and accept (begrudgingly) new price levels. This basic ‘supply and demand’ principle of auctioneering is further complicated by the rising concept of whisky investment. This ‘knowledge’ of great liquid is acquired and re-purposed by others who spend in order to profit from the dependable passions of drinkers and collectors (terms which are often deeply intertwined). Another result of whisky’s digital expanse over the past 15 or so years has been a kind of cultural proliferation. It’s a popular proclamation that whisky is ‘just a drink’. The truth of the matter, however, is that it has become more than just a drink. For new generations of young people around the world, whisky can be a status symbol. It can be a trend; it can be as much an external expression of your character as clothing, watches or grooming. Whisky is a culturally relevant product which has become susceptible to the kind of mass mindset which allows brands such as Macallan or Johnnie Walker to assimilate themselves to positions of deep cultural relevance and desirability. One of the results of this phenomenon, on the secondary market, is the prices paid for Macallan. Astonishing old bottles of Campbell, Hope & King Macallan from the 1960s can sit in the same price bracket as mundane, NAS (non-age-statement) modern releases by virtue of a name. The cause of this has been partly the drive of the companies to nurture this lucrative environment and partly in response to naturally evolving socio-cultural trends. The two forces have existed in a delicate symbiosis, a side-effect of which has been an increasingly complex and influential secondary market. Likewise, similar factors of cultural fascination play an important role in the explosive prices for Japanese whiskies in recent years. Europeans attach increasing cultural heritage, relevance and value to whisky – look at the lofty heights to which we’ve elevated Samaroli and other early Italian bottlers. People talk a lot about ‘the bubble’ these days and gleefully rub their hands over the idea of ‘the burst’. This position is simplistic though. The truth is that today’s secondary market contains many bubbles. People gawp at the way whisky auctioneering marched online and seemingly began to tear up the whisky status quo. In retrospect, though, it seems surprising that it took so long, considering the German whiskyauction.com was active as early as 1997. This is not to say that there isn’t fragility to the secondary market. People all around the world have lapped up these notions of whisky investment, often overlooking the fact that the ideas have been deliberately and aggressively perpetuated by people with large collections of their own and more than a little vested interest in the concept. If enough people begin to unload these investments back through the secondary market, then I suspect we would see significant strain. In the meantime, though, the multiple forces of cultural fascination, proliferated knowledge, traditional supply and demand, and investment – and in many cases complex combinations of each – have driven prices to the point of incredulity in recent months. The result is, unsurprisingly, deeply frustrating for those of us who seek to buy amazing bottles and are willing to spend to do it, but simply cannot afford to compete with such financial muscle. This in turn perpetuates other aspects of the industry. For example, many of us detest bottle flipping, but I will freely admit to having sold bottles I wasn’t too interested in because I knew they’d fetch a meaningful enough profit that I could use to buy bottles I did want and couldn’t otherwise afford. This is far more common than you might think on the secondary market and offers a glimpse into how – for rare, older or perceived ‘higher-value’ whiskies – it is altering and influencing consumer behaviour. In fact, the ‘consumer’ has become the speculator, the trend follower, the investor, the collector, the drinker and the flipper. What the long-term effect of this will be is uncertain. Prices seem unsustainable right now, but we were saying this as far back as 2009. Ask yourself: what is the most beautiful whisky you ever tasted? What would you spend to possess more of it? Now theoretically deepen your pockets and (being honest with yourself) does that figure not also increase? The secondary market has expanded in intricacy as more and more people migrate their spending to this alternative framework. And who can blame them? It’s more fun, the variety is greater and you decide your own prices. The danger, some might argue inevitably, is that it becomes a wealth clique where the majority of us are confined to bottom feeding and almost all old, rare or interesting whiskies disappear into the stratosphere. It also means that, as the secondary market grows, it will likely become increasingly susceptible to the whims of the wider economy. For people like me who adore these whiskies (and attempt to buy them for the purposes of opening to make a living), I cannot deny that the thought of a ‘price correction’ is alluring. However, as the secondary market begins to increasingly mirror and exemplify the disproportionate wealth gap in our global society, I’ll not be holding my breath any time soon. Whisky has value, and the rise of the secondary market is rapidly redefining the how and why of this value. This phenomenon should also give us all pause for thought about our own perceptions of whisky’s worth – especially what we value about it and why. 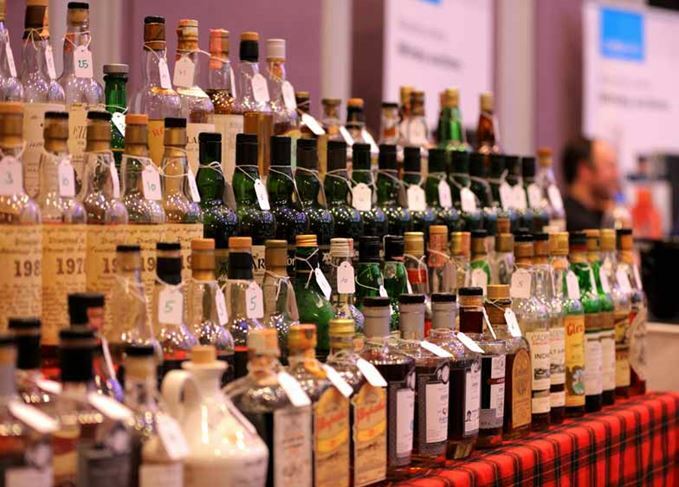 UK whisky auction sales have ‘never been stronger’, a report has revealed. The single malt collection almost doubled its pre-sale estimate, selling for nearly HK$8m.